A grand mystery reaching back centuries. A sensational disappearance that made headlines around the world. A quest for truth that leads to death, madness or disappearance for those who seek to solve it. "The Lost City of Z" is a blockbuster adventure narrative about what lies beneath the impenetrable jungle canopy of the Amazon. After stumbling upon a hidden trove of diaries, acclaimed "New Yorker" writer David Grann set out to solve "the greatest exploration mystery of the twentieth century": What happened to the British explorer Percy Fawcett and his quest for the Lost City of Z? In 1925 Fawcett ventured into the Amazon to find an ancient civilization, hoping to make one of the most important discoveries in history. For centuries Europeans believed the world's largest jungle concealed the glittering kingdom of El Dorado. Thousands had died looking for it, leaving many scientists convinced that the Amazon was truly inimical to humankind. But Fawcett, whose daring expeditions helped inspire Conan Doyle's "The Lost World, " had spent years building his scientific case. Captivating the imagination of millions around the globe, Fawcett embarked with his twenty-one-year-old son, determined to prove that this ancient civilization which he dubbed Z existed. Then he and his expedition vanished. Fawcett's fate and the tantalizing clues he left behind about Z became an obsession for hundreds who followed him into the uncharted wilderness. For decades scientists and adventurers have searched for evidence of Fawcett's party and the lost City of Z. Countless have perished, been captured by tribes, or gone mad. As David Grann delved ever deeper into the mystery surrounding Fawcett's quest, and the greater mystery of what lies within the Amazon, he found himself, like the generations who preceded him, being irresistibly drawn into the jungle's green hell. His quest for the truth and his stunning discoveries about Fawcett's fate and Z form the heart of this complex, enthralling narrative. David Grann has been a staff writer at "The New Yorker" since 2003. He has written about everything from New York City's antiquated water tunnels to the Aryan Brotherhood prison gang, from the hunt for the giant squid to the mysterious death of the world's greatest Sherlock Holmes expert. His stories have appeared in several anthologies, and he has written for the "New York Times Magazine, The Atlantic, "the "Washington Post, "the" Wall Street Journal," and "The New Republic," where he is also a contributing editor. "Few things are better than experiencing a horrendous adventure from the comfort of your own armchair. Hordes of mosquitoes, poison-arrow attacks, bizarre and fatal diseases, spies in starched collars, hidden outposts of Atlantis -- what's not to like? 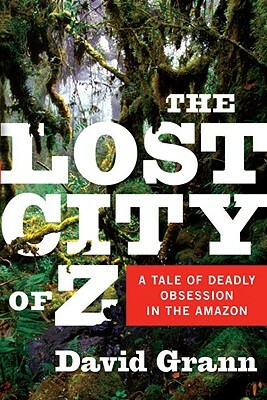 The Lost City of Z is like a wonderful 19th-century tale of exotic danger -- except that David Grann's book is also a sensitively written biographical detective story, a vest pocket history of exploration, and a guide to the new archaeological research that is exploding our preconceptions of the Amazon and its peoples." "The Amazon has had many chroniclers but few who can match David Grann's grasp of history, science, and especially narrative. Shifting seamlessly between the past and present, THE LOST CITY OF Z is a riveting, totally absorbing real-life adventure story." "The story of Z goes to the heart of the central questions of our age. In the battle between man and a hostile environment, who wins? A fascinating and brilliant book."